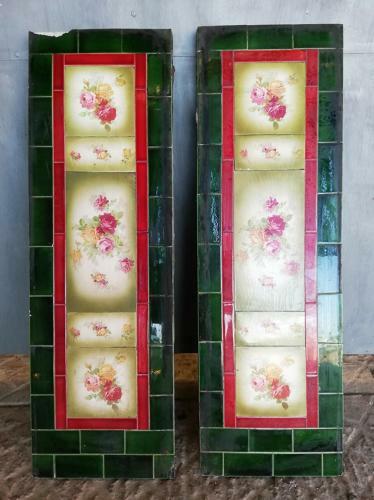 A pair of very pretty fire tile panels, designed to be placed on either side of a fire. The panels are often cemented in to the side of hearth to add character to a fireplace. The fire tiles have a lovely design with delicate pink and yellow roses. The central tiles are surrounded by pink border tiles and surrounding that are green metro style tiles. The tiles are set into heavy concrete panels that fit in to or at the side of a hearth. The tiles are in good condition and the colour bright and clear, but there are some signs of wear, as expected of antique items. The tile glaze has some light crazing and cracking. There are some residue smoke marks from use and the tiles would benefit from further cleaning. One tile panel has a break to its top. There is some slight cement residue to the sides of the panels. The tile panels are of a very good quality and the painted design very fine. A lovely set of tiles that would add character and charm to a home.